Anchor Hocking TrueSeal Glass Food Storage Containers conveniently store and re-heat your leftovers, salads, prepped food and ingredients. It will keep your food fresh with the leak preventing lid that provides optimal storage and transportation. Made from tempered glass, the clear base makes it easier to identify and locate contents. The base is microwave, oven, freezer and dishwasher safe. Lid may not be used in microwaves and oven, but is top rack dishwasher safe. SET CONTAINS - (6) 1 cup capacity round food storage containers with cherry Trueseal lids. Made in the USA. CONVENIENT - Store and re-heat your leftovers, prepped food and ingredients. Moreover, the clear base makes identifying and locating contents easy at a glance. VERSATILE - Containers are durable with leak preventing lids to avoid those leaky moments and easy transportation. 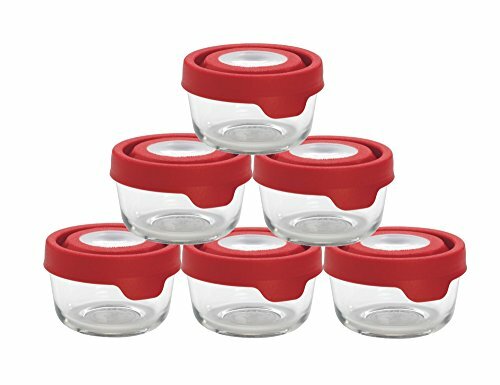 FEATURES - Tempered glass container with BPA free TrueSeal lid and over-molded design that keeps food and bacteria from getting stuck in lid. COMPONENTS - Freezer, microwave and oven safe up to 425 degrees Fahrenheit (lids are not oven safe). BPA free lid is top rack dishwasher safe. SET CONTAINS - (6) 1 cup capacity round food storage containers with cherry Trueseal lids. Made in the USA. If you have any questions about this product by Anchor Hocking, contact us by completing and submitting the form below. If you are looking for a specif part number, please include it with your message.